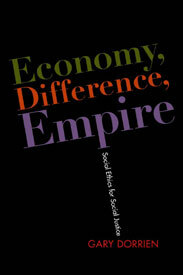 Economy, Difference, Empire: Social Ethics for Social Justice, by Gary Dorrien. Recommended by NCC Poverty Director Rev. Michael Livingston. Gary Dorrien argues for the social-ethical necessity of politics well seasoned in social justice. His essays analyse major historical and contemporary figures such as Walter Rauschenbusch, Reinhold Niebuhr, Rosemary R. Reuther, Ctie Cannon, and Cornel West. Dorrien’s own personal experience in movements for social justice is woven into his narrative. Click here to go to the Columbia website, where you can buy the book and read more about it. Dorrien will be a keynote speaker at 2012 Ecumenical Advocacy Days, March 23-25 in Washington DC. If you’ve read this book or you want to, comment on the blog to start a discussion, or tweet us @NCCEndPoverty.